Skiing safety is always an important topic. Over the years, while skiing with very young children, then teens and now young adults, our family developed three “Rs” to help us remember to be safer skiers. The three “Rs” are Risk, Rewards and Responsibility. Skiing is a social sport. At a ski area or resort you share the pistes with hundreds, if not thousands, of other skiers and snowboarders. While on the mountain, you and your family are part of a large community. Communities need rules to help keep everyone safe, for example the FIS Ten Rules for Conduct. Knowing the rules, following the rules and practicing skiing and snowboard safety helps minimize the risk of skiing and snowboarding. Here are some rewards of skiing and snowboarding: The speed. The feeling of flying with your feet on the ground. The joy of carving perfect turns or leaving a set of tracks in fresh snow. 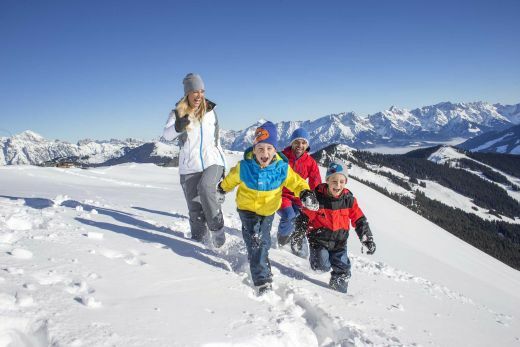 These rewards, and many others, are why so many families love skiing and snowboarding. If the rewards didn’t outweigh the inherent risks, many of us would choose a different sport. But this is where balance comes in. To keep everyone safe and happy, the rewards must be balanced with the risk. When skiing with your family or in another group, never take someone on terrain that is too difficult or force anyone to ski when they are tired or hungry. Instead, before you lead anyone into difficulty, evaluate what you’re about to do. Can everyone handle the tree shot (or mogul run or chute) we’re about to take? Are there too many people on this run to carve big GS turns? Are the snow conditions appropriate to the way we are skiing? Is anyone too tired or hungry to take this run? These are the type of questions it’s important to ask your children on the lift before you choose a run. It’s also smart to teach your kids to ask these questions of themselves. This is especially important with older kids who ski independently with their friends. So that your children can safely balance risk and rewards, even when you’re not there, teach them to do “gut checks,” to evaluate how they are feeling and to take a break when necessary. It’s important that children learn to listen to themselves and their friends. You can reinforce this by modeling respectful behavior. For example, by going in for lunch because your spouse is hungry, even when you really want to take another run. This shows your children that there is no shame is speaking up, taking a break or asking to ski easier terrain. If you’re a parent, you know that it can be difficult to teach children to take responsibility for themselves, for their stuff and for their homework. These can be hard lessons with lots of tears. Still, accepting and taking responsibility for oneself is a hallmark of maturity and becoming an adult. - Know and follow the Rules of Conduct. - Respect Ski Patrol and follow their directions. - Be aware of others on the mountain and give them plenty of room. - Ski or ride within your ability. - Take care of your equipment and make sure it works properly. - Keep yourself in good shape to avoid injury. - Always wear a helmet. If you and your family can do these things, you’ll enjoy a lifetime of rewarding, exhilarating skiing together. You’ll also be set with some good lessons for a successful life.